The great pioneer of Modernist architecture, Le Corbusier has created a multitude of stunning buildings across the world – from France to India, the USA and back. Here we take a look at ten extraordinary examples of his work, which every architecture lover should know. Villa Savoye is arguably Le Corbusier’s most renowned work, and a prime example of Modernist architecture. The sleek geometry of the white living space, with its elongated ribbon windows, is supported by a series of narrow columns around a curved glazed entrance – and topped with a solarium. Completed in 1931, this building was revolutionary: the use of reinforced concrete required for fewer load-bearing internal walls, allowing for an open-plan design. 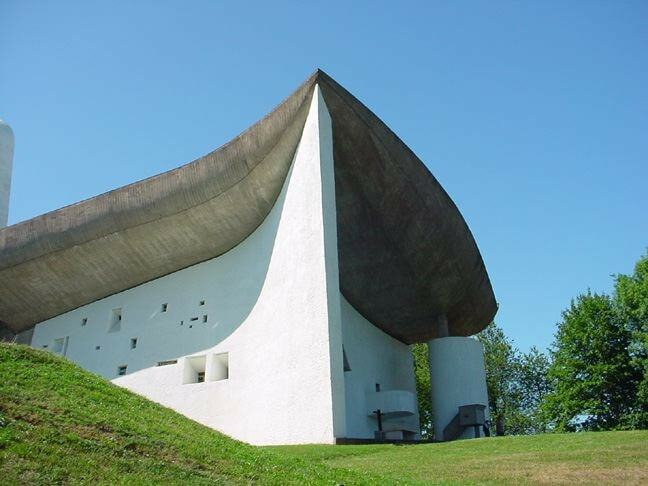 Iconic Notre Dame du Haut is one of the earliest Modernist churches. It is not a total departure from traditional church architecture, with its stained glass, tower and high ceilings, symbolically drawing the eye – and the mind – towards heaven. However, the southern wall is most remarkable, beginning as a narrow point on the eastern edge and expanding outwards to ten feet of thickness as it curves around. Each window is cut through the wall in different sizes and angles, scattering ethereal colored light across the room. Villa Jeanneret & Villa La Roche are two semi-detached houses commissioned in 1923-25, and now house the Le Corbusier Foundation. Due to contemporary building regulations, windows were limited, so light courts, a roof terrace, and skylights were introduced to harness the natural light available. The sleek white exterior with dark framed ribbon windows is similar to that of Villa Savoye, but the asymmetry of the structure – with a curving roof terrace evoking the deck of a ship – gave it new freedom. The meeting place of world leaders, the United Nations Headquarters is a building with status. The imposing rectangular tower is dominating, yet dignified. Surrounded by the skyscrapers of New York, this building needed to stand out: blue-tinged glass reflects the water below, while the two windowless concrete walls give the building a refined status of solidarity and endurance, which are key aspects of the United Nations. 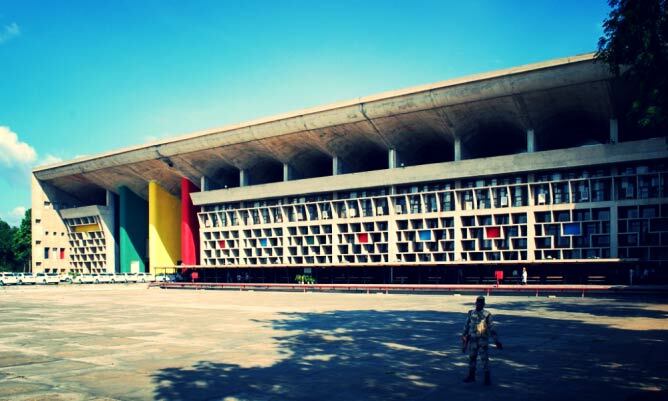 The colorful structure of the Palace of Justice is a prime example of Le Corbusier’s work in India. With a curving roof similar to Notre Dame du Haut, the regularity of the arcade gives the building gravity and solidity. The geometric apertures of the windows resemble traditional Indian fretwork, creating a texture that contrasts with the smooth faces and tactile curves of the roof. Red, yellow, and blue, combined with the colors of the Indian flag, complete this balanced and harmonious building. The Palace of Assembly is the elegant counterpart to the nearby Palace of Justice. Set beside an azure pool, this busy place nevertheless evokes serenity and reflection. There is a regularity to the building, with few deviations from the design system. A flat-roofed block with rectangular windows is hidden behind a monumental facade, with a U-shaped roof piercing the severity of the concrete. More sedate than the colorful Palace of Justice, its equilibrium of form and symmetry nevertheless makes the Palace of Assembly an equally-striking building. Now home to Centre Le Corbusier, the Heidi Weber Museum was originally commissioned as an exhibition centre. Located beside blue Lake Zürich and surrounded by evergreen firs, the location vibrates with color. The steel-framed building contains sheets of glass and primary colors beneath a vast grey roof, hovering like a geometric cloud above the structure. Taking inspiration from Rietveld’s Schröder House in Utrecht, and the works of De Stijl artist Piet Mondrian, this building embodies an era of new and exciting art and architecture in Europe. 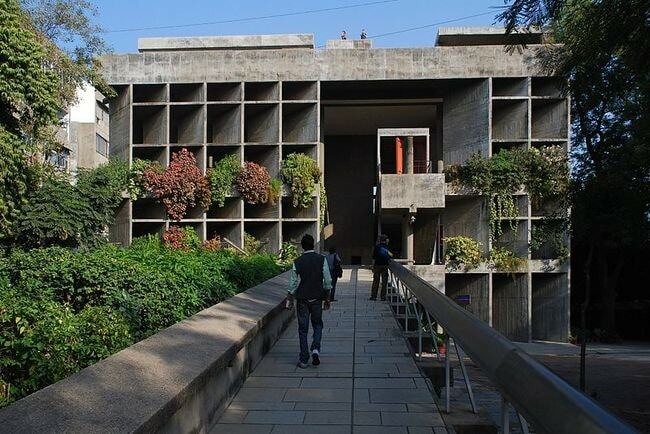 After Le Corbusier began his work in Chandigarh, he began to create a new headquarter for the Mill Owners’ Association. While there are few curves in this building, the slanting walls beside the small, domestic windows give depth to the texture of the building. The structure does not appear dominating or austere, but warm, welcoming and full of life. The verdant location and integrated foliage are vital to creating a healthy atmosphere. Sainte Marie de la Tourette is a Dominican priory, considered one of the most important works of Modernist architecture in the world. There are 100 bedrooms, various halls, a library, a refectory, a courtyard, cloisters and a church. The refectory and cloister form a symbolic cross leading to the church. There is also symbolism in the rough finish: it is functional, tough and unrefined, but this helps create a harmony in the buildings, compatible with the life of those within. The last major work of Le Corbusier, the building was completed posthumously in 2006 – 41 years after his death – by his student José Oubrerie. The great cone rises from the land like the surrounding mountains, and while the exterior is plain concrete, unanticipated beauty awaits inside. Le Corbusier’s innovative use of windows is epitomized in Saint-Pierre, with strips of windows in primary colors and a projection of circles akin to constellations in the night sky. 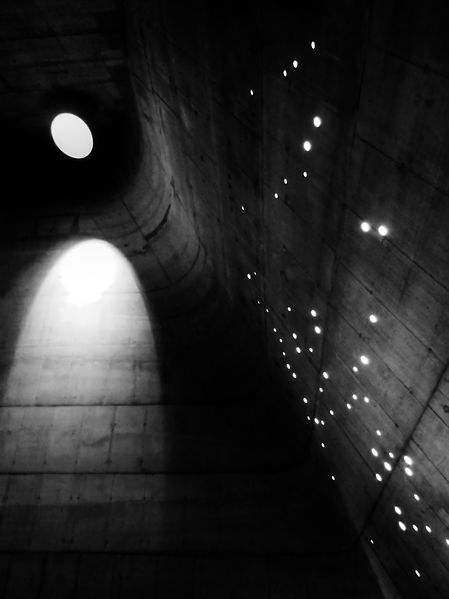 The space is a cave that embraces the visitor like a womb – a sanctuary in the turbulent world.